Strydom has owned a number of businesses over the years. Twelve years ago, he created Eliance (Pty) Ltd. This business was sold to McCarthy and Strydom is still the MD. He is a graphic designer and well-known artistic photographer. He studied graphic design and then law at the UOFS. As the marketing director of the McCarthy group, Strydom is responsible for all marketing activities across the business units. He is also the CIO of the group and responsible for all ICT-related functions. 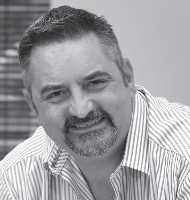 In addition, Strydom is the managing director of Eliance (Pty) Ltd, a wholly-owned subsidiary of the McCarthy group. Eliance is the leading automotive software development company in South Africa. Other business units that report to him include McCarthy Corporate Fleet Services (fieet sales division), Club McCarthy (loyalty division) and Call A Car (online vehicle sales division).